Monticello on a tight budget with green construction. This 19,000 square foot charter school in Cottonwood, Arizona, is certainly unique. When I first met the headmaster of the school, he held up a picture of Thomas Jefferson’s Monticello and said “this is what we want” – he takes his school’s title very seriously and proudly. My input, given that operating costs would play a significant role in the success of the school, was to be as energy efficient as possible. In league with the project manager Mack Coker, we met all their needs. 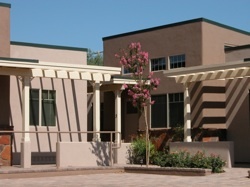 The entire school is built of SIP panels – roofs, exterior walls, and interior partitions. Further, all classrooms, including the gym, are taken to full natural daylight using skylights. Additional lighting, controlled by light sensors, only comes on when (very rarely in the daytime), and with fixtures, needed. As such, utility bills for this school are, during some months, in the range of those for a large custom home. And the total building cost was roughly ½ what it would have been with construction typical to school construction, while the time to build took only 10+ months, similar to that required for a large custom home. 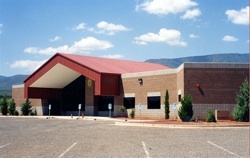 The Legion Hall, American Legion Post 25 in Cottonwood, Arizona, was one of many projects brought to me by contractors. The project combines metal building technology with colored masonry for a clean, contemporary look. 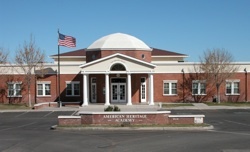 A multi-purpose building, the Legion Hall serves as a gathering place for both the Veteran members and for local civic functions. I include this as just another example of architectural diversity, within the umbrella of green commercial architecture. This project was designed while at the office of F & D Associates and is the property of said firm. Having been voted the Best Bed & Breakfast Inn in America, Canyon Villa has been a highly successful project. The Inn is an 8600 square foot bed & breakfast with 11 guest bedrooms – including a fully handicapped accessible room – and generous private owner’s quarters. The great room with two-sided fireplace has a soaring 22 foot ceiling, dining seating for up to 26, and sweeping views of Bell Rock, Courthouse Rock and Lee Mountain and opens onto a patio with outdoor dining, rose garden and even more expansive views. The Inn backs up to national forest, all rooms are sound isolated and no two the same, and each with a private balcony or patio. Monika Cate’s stained glass is on display in arabesque windows throughout the Inn. And the success started right away. The owners though it would be a year or two before they hit full capacity. But they were full the second week they were open. 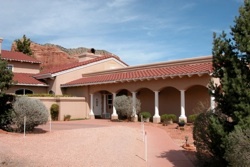 Very soon, Canyon Villa was voted the top B & B in Arizona. Since then, this bed and breakfast has been voted the top bed and breakfast inn in the United States. Additionally, it has been featured in the book The Romance of Country Inns (see article under the Publications section of this website), as well as numerous other published articles. Pine Terrace Condominiums was a remodel and addition conversion project. Taking some very dated 1964 apartments on Jordan Road in the Main Street Program part of Sedona, this property was transformed. Though seemingly modest at 830 square feet, each unit now has two bedrooms and one bath, 13 foot ceiling in the living room, true vaulted ceiling in the luxury kitchen, private back yard and small front patio. 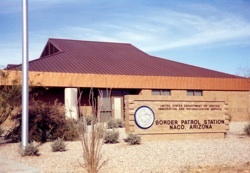 Further, the remodeled building includes R-38 walls and roof, on-demand hot water, wood floors and native stone site walls and wainscoting among the many features. 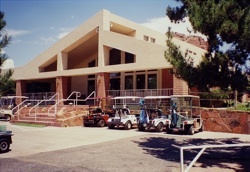 This was an addition and remodeling project for a golf course clubhouse in Sedona. What started as a need to replace the wood shake roof which was falling apart, the project became more inclusive. We replaced all roofing, improved pitch where standwater had caused leakage and increased insulation to these roofs, replaced existing roof-mounted mechanical equipment with new efficient units while enclosing them in an architecturally integrated penthouse. Further, we added 4000 square feet of structure to cover the golf cart parking yard, and significantly remodeled the exterior of the clubhouse to bring the architecture up to date. All this was ultimately built at more than $50,000 under original cost estimates. And gave them what looked like a completely new clubhouse.